Une couleur jaune pâle, avec des reflets brillants. Un nez aromatique, avec des notes d'agrumes et de fleurs blanches. En bouche, on sent une certaine tension (à l'opposé de gras et d'opulence). Le vin est frais, minéral et laisse une finale très agréable. Light yellow-gold. Lively citrus and orchard fruits on the high-pitched nose. Tightly wound lemon and bitter pear skin flavors are light-bodied and nicely focused, with a gingery nuance adding bite. Closes with good clarity, decent persistence and lingering spiciness. 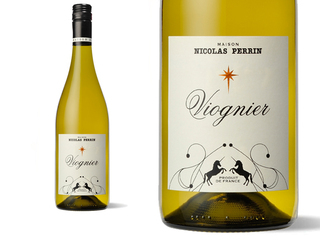 An aromatic, pure style, with green plum, yellow apple and anise notes that bounce through a bright, unadorned finish. This Viognier is a recent example of the ongoing collaboration between the Perrin Family, famous for their Southern Rhône Valley wines, and Nicolas Jaboulet, a specialist from the Northern Rhône. The Viognier vines are planted on relatively high slopes in the Ardèche region. The exceptionally hot weather in the early summer of 2012 is reflected in the ripe fruit flavors of the wine, which has a moderately mellifluous texture as well as hints of honey to tease the taste buds.